Shopping and dining in downtown Hastings is a treat with unique local shops and eateries. You will find the latest fashions, antiques, technology, art and collectibles in a pedestrian-oriented setting. In downtown Hastings you can see over 15 bronzes statues and read plaques on many historic buildings. In the last decade many of historic buildings have been renovated both inside and out. Over 35 upper level residences can be found on the 2nd floor of many of the buildings. Several facades have been renovated with the historic character of the buildings in mind. A variety of parades and events happen in the downtown throughout the year including the Celebration of Lights, Do the Brew, Sidewalk Sales and Farmers Markets. 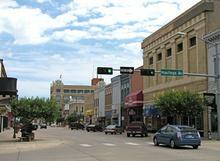 For more information about downtown Hastings please visit www.hastingsdowntown.com.